I use Magigoo. It’s helped solve the issue of warped prints. It’s one of the most important things to get right in 3D printing. If your print doesn’t stick to the bed properly then your part will probably be a failure. If you are prototyping parts for a client then you can’t deliver a print that has warped at the edges. If you are planning to use a print as an actual useable product e.g. maybe a replacement part for a bike or replacement cooker knob, then the design you print has to be accurate. If the edges have warped then you compromise the integrity of the design and your faith in 3D printing will be put to the test. I have struggled over the years with bed adhesion. I’ve used the imfamous blue tape, kapton tape and hair spray to list a few, but none of them have delivered the right results. It always been a variable that was hard to control. Also the filament quality you use can effect the print adhesion which can just add to the woes. However, things changed when I was sent a sample of Magigoo to test out. I had never really tried an adhesive before. The only thing I had seen were a few users online using glue sticks, however this was just fraught with issues and wasn’t a long term sustainable solution. Magigoo was totally different, firstly it has been specifically designed for 3D printing, unlike the other adhesives that primarily are used for other things. The developers of Magigoo had obviously put a lot of research and development into trying to solve the issue of warped prints. The first test sample arrived about 18 months ago and I used it straight away. It was pretty easy to get started, you simply had to squeeze the bottle and push down the nib to activate the adhesive solution. Then you just had to cover the print bed in even strokes, let it dry for a few minutes and then heat the print bed and start printing. A great feature of the adhesive is that it didn’t give off any noticeable smell and you could apply it direct to the print bed. Some other adhesives require you to remove the print bed before applying. This slows the 3D printing experience down and also leaves you with issues of levelling the bed every time the bed is removed. Magigoo could just be applied directly to the bed. The fact that it was non-toxic is a huge benefit, especially when being used in schools. Any toxic substances that are used in education have to be subject to COSHH regulations and risk assessments completed for them. In the case Magigoo can be used in confidence in education as no odour is given off. After the first successful use of Magigoo I decided to print a nest of designs. I loaded up the print bed with 5 copies of a design that previously couldn’t print successfully and would warp when using blue tape The first print of the nested designs worked which was fantastic. To remove the prints you just had to let the print bed cool down and then they came of the ned with ease. There were no residue left on the prints and the over quality of the parts had clearly improved. I printed using PLA, ABS, Co-polyester and Colorfabb XT. On all occasions when we followed the directed advice we had successful prints. After every couple of prints I had to clean the bed down and then reapply the adhesive. To clean the bed was easy, simply use a warm damp cloth and give the print bed a quick rub down. It was easy to clean the bed, unlike some other 3D printing adhesives that use toxic chemicals. Make sure that you have turned your printer off before doing this for obvious safety reasons. Magigoo then sent their second-generation product which had an upgraded nib and rebranded package to test out. The upgraded nib was an improvement as the nib was less porous then the first design. This nib didn’t absorb any of the adhesive unlike the first. This meant that the adhesive was applied faster to the bed, rather than having to be absorbed through the nib first before reaching the print bed. This was a good move because I checked out the first generation pen the other day and the absorbent nib was glued solid after being left a few months. The conclusionfor the upgraded product was a positive design decision and Magigoo is a great product to have in your 3D printing tool kit when trying to solve the dreaded issue of getting those 3D prints to stick. Depending on how big you are printing the adhesive can really last a long time and the initial cost will easily repay itself in saved filament from not have failed prints. Also, this will help if you are 3D printing a large volume of prints. If you have a deadline to meet, then you can’t afford for prints to be peeling off the print bed. When you have confidence in your products and you know it will be a successful print then you can schedule your manufacturing plans more easily. I have been involved in 3D printing for the past five years and founded the 3Dfilemarket file sharing website. 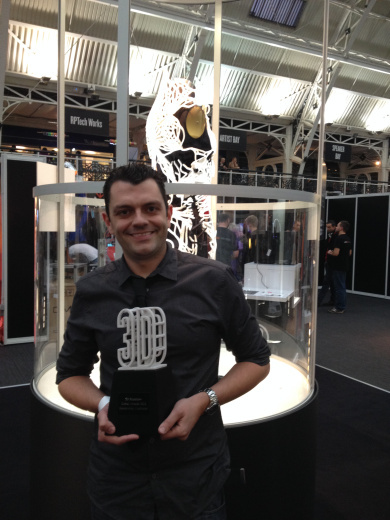 I was also awarded the 3Dprintshow Educational Excellence award in 2013 and 2014 for my work in introducing 3D printing into the classroom for high school students.